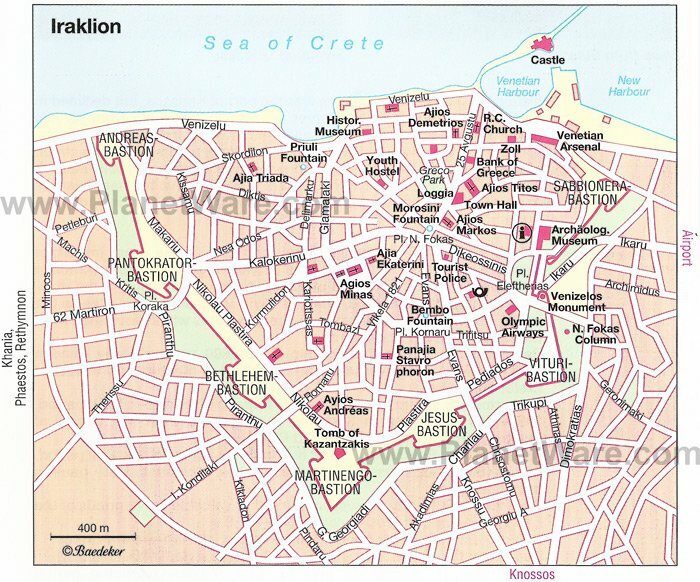 Heraklion (Iraklion), on Crete's north coast, is the island's capital, chief port, and main industrial center. With a population of some 174,000 and sprawling modern suburbs, it's also the fourth biggest city in Greece. In ancient times, it was the port of Knossos, and the Minoans would have traded gold, ceramics, and saffron from here. Europe's oldest known civilisation (they lived on Crete between 2700 BC and 1450 BC), the Minoans were remarkably sophisticated - they loved art, nature, and sport, and it seems they were a peaceful people who worshiped female goddesses. Today, most visitors to Heraklion come here specifically to visit the Minoan palace of Knossos. Heraklion grew up around the sea, and still today, the old town focuses on the harbor, with its most notable monument being Koules, an imposing 16th-century fortress built by the Venetians - you can climb up onto the ramparts for splendid views. From here, you can see the arsenals, vast arches with vaulted spaces where the Venetians repaired their ships, and the busy coastal promenade, lined with seafood eateries. The old town is protected by a circuit of massive defensive walls, which have been demolished in parts. Inside, its pedestrian-only streets are lined by aristocratic buildings, churches, and boutiques, and open onto a leafy square with fountains and busy cafés. 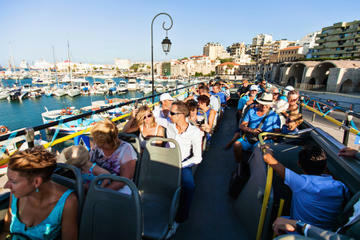 Crete's biggest and best preserved Minoan site lies five kilometers southeast of Heraklion, to which it is connected by public bus. A vast monumental palace, with four wings built around a spacious central courtyard, Knossos is believed to have been the mythical Labyrinth of King Minos. Remarkably sophisticated, it included ceremonial spaces, living areas, storage rooms, elaborate decoration, and a complex drainage system. 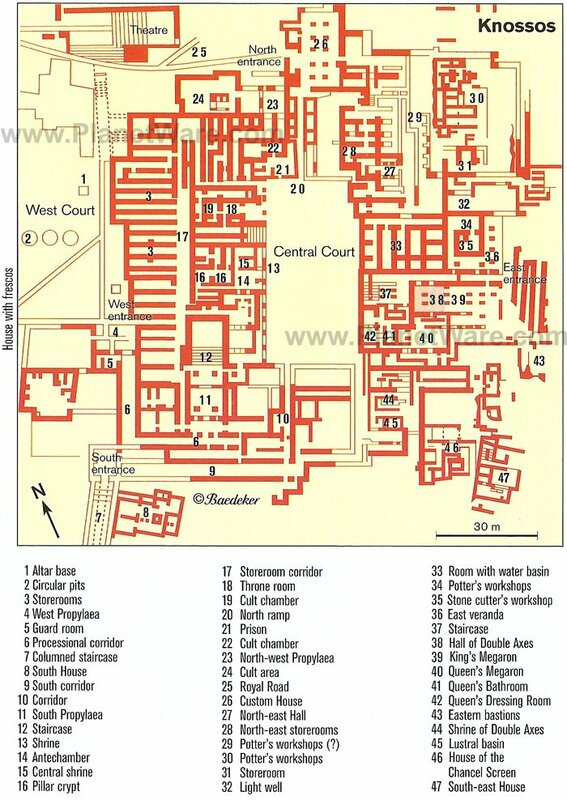 Although excavations show that there was a palace here as early as 2000 BC, what you see today dates mainly from 1450 BC, with some slightly over-imaginative reconstruction from the early 20th century, plus replicas of many of the frescoes (the originals are in Heraklion Archaeological Museum). Magnificent 3,500-year-old frescoes from Knossos, including Prince of the Lilies and Bull-Leaping, are currently on display at this museum, as are the Snake Goddess, a glazed ceramic figurine of a lady holding two snakes, dated 1600 BC, and the Phaistos Disk, a clay disc bearing a curious spiral of symbols from around 100 BC. Although the museum's main building has been closed for renovation since 2006, you can still see this excellent temporary exhibition of some 450 ancient finds from across the island, laid out in chronological order with explanatory texts in both Greek and English. This world-class museum is Heraklion's principal tourist attraction and lies in the eastern part of the old town. With a succession of foreign occupiers, Crete's history is complicated but fascinating. This museum traces 1,700 years of history on the island, from early Christian times to the modern era. You'll see religious icons, stone carvings, ceramics, textiles, and folk costumes from the Byzantine, Venetian, and Turkish periods, as well as somber space dedicated to the Cretan Resistance Movement and those who lost their lives during WWII. Everything is well presented and clearly labeled, and there's a peaceful garden café. You'll find it in a restored mansion, a 10-minute walk west of the old harbor. At this huge modern aquarium, you can experience the underwater life of the Mediterranean. A fascinating day out for kids and adults alike, it has 32 vast glass tanks displaying everything from hunter sharks to miniscule seahorses, jellyfish, turtles, lobsters, and octopus, all in beautifully-lit turquoise sea water against a backdrop of rocks, sand, and seaweed. 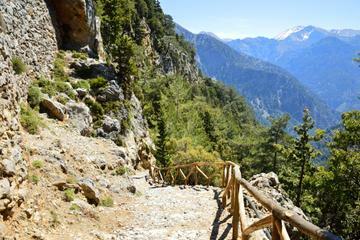 You'll find it at a former American military base in Gournes, 13 kilometers east of Heraklion. In the 16th century, Heraklion was home to an important school of religious icon painters. One of its members, Domenikos Theotokopoulos (1541-1614), went on to become a world-class artist, better known as El Greco. He was born in the humble village of Fodele, set amid orange groves 28 kilometers west of Heraklion. Today, the stone cottage where he was born is a museum. Theotokopoulos moved to Spain in 1577 and lived and worked there until his death. His paintings are noted for their intense color and drama, and you can see several reproductions of his works here. Overlooking the Libyan Sea, 67 kilometers southwest of Heraklion, Matala is probably the most visited resort on Crete's remote south coast. It was made famous by the hippies in the 1960s, who lived here in caves in the reddish sandstone cliffs above the nudist-friendly Kokkini paralia (Red beach)- Joni Mitchell even wrote a song about it, Carey. No one is certain how Matala's extraordinary caves were made - some archaeologists believe they were Roman or early Christian tombs. The village of Matala lies a 20-minute walk from the caves and overlooks its own sandy beach, complete with sunbeds and umbrellas for hire. Phaestos is another magnificent Minoan palace, which some people prefer to Knossos as it is unrenovated and more atmospheric. What you see today are the ruins of a palace, built around 1600 BC, centering on a spacious paved courtyard and beautifully located on a sunbaked hillside backed by the rugged heights of Mount Psiloritis overlooking the deep blue Libyan Sea. The views from the site are spectacular, and in summer, it catches a blissful cool breeze. Phaestos was abandoned around 1400 BC, the same time as Knossos, and archaeologists still have to find a good explanation why. It lies 62 kilometers south of Heraklion, just a 15-minute drive from Matala. GDM Megaron Hotel: affordable luxury, excellent value, rooftop restaurant, sea view pool, short stroll to the port. Olive Green Hotel: upper mid-range rates, eco-friendly, sleekly-furnished rooms with tech-friendly features, great breakfast selection. Lato Boutique Hotel: three-star hotel, near restaurants and shops, sea views, rooftop deck, herb garden, complimentary breakfast with fresh-squeezed orange juice. Stelios Gardens: budget rates, steps from the beach, swimming pool with plenty of sunbeds.